On Wednesday, August 3rd, 2016, at approximately 5:00 p.m., Smithfield Police Detectives, arrested Dante V. Stanzione, age 29, of 39 Knight Hill Road, Scituate, charging him with Possession of Heroin with intent to Deliver, Possession of Heroin and Possession with intent to Distribute a Controlled Substance near a School. 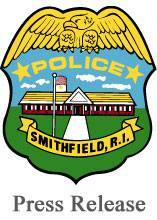 After learning of illicit drugs being sold in the Town of Smithfield by Stanzione, Detectives conducted surveillance of Stanzione over the past several months. This investigation resulted in Detectives obtaining a search warrant for Stanzione and his vehicle. Detectives seized 3.4 grams of heroin, digital scales and packaging materials. Mr. Stanzione was taken into custody, without incident, in the parking lot of Newport Creamery at the corner of Putnam Pike and Greenville Avenue. Mr. Stanzione was held overnight and transported to Third District Court on Thursday morning, August 4th, 2016, to answer the charges.